The Curiosity science team recently released a new Mars Reconnaissance Orbiter image, showing Curiosity’s overall route since its landing on Mars in August 2012. I have posted a reduced version on the right. 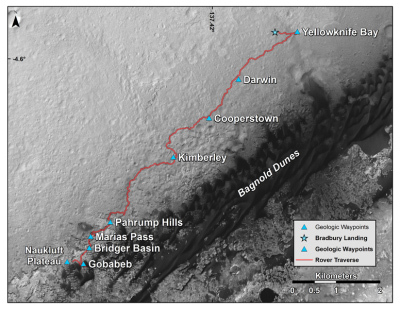 Similarly, on the Curiosity website you can view this more detailed map of its traverse route. This map is updated regularly as Curiosity continues its climb up Mount Sharp. Neither of these maps is to me very satisfying or useful, however. Neither shows the overall location of Curiosity within Gale Crater. Nor do they give one a sense of how far it is has come on its climb up the mountain. In fact, it is very unclear how close the rover actually is to the peak from either image. Thus, I decided to do a little research to get some better context of Curiosity’s position and its overall journey. The image below of Gale Crater is a reduced and annotated version of a NASA image available here. 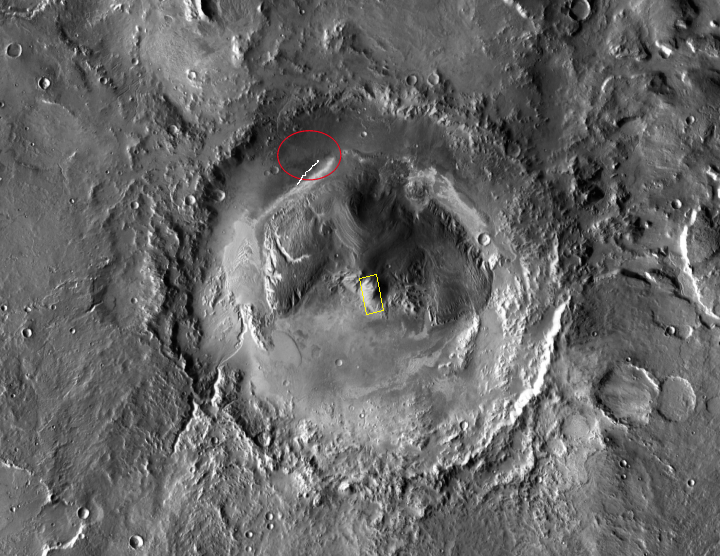 The landing ellipse that Curiosity was targeted at is indicated by the red circle. It is north of Mt Sharp inside the rim of Gale Crater. I have added the rover’s approximate route in white since its landing to show its present location relative to the entire crater. How far however has Curiosity come in its mission to climb Mount Sharp? Well, the mountain itself is quite spread out, and in fact fills much of the crater. For example, this Mars Reconnaissance Orbiter image, reduced and shown on the left, shows the central peak, but that is only a tiny area on the larger image above. To give you an idea how tiny, the yellow box indicates the area of the central peak that is imaged on the left. It is instantly apparent that Curiosity has barely begun its journey up the mountain’s slopes in its four years of roving, and is still a gigantic distance from that central peak. As for elevation, the central peak is estimated to be about 5,500 meters or 18,000 feet high. The detailed traverse map shows contour lines with the elevation numbers set to show the needed distance to reach the peak. Right now Curiosity is still 4,424 meters or 14,514 feet below the peak. It has gained about 1,100 meters or 3,500 feet, but there is long way to go to get to the top. Finally, the computer image below, released shortly before the rover landed, gives the best sense of the journey so far, and how much more has to be accomplished. The view of this image is from the north, looking south. I have indicated in red the approximate path Curiosity has traveled in the four years since landing. From this we can see that Curiosity has barely entered the lower foothills of Mount Sharp, and even when it gets higher it will have to traverse a lot of territory to get to the central peak, the high point farther to the south and to the upper left. I expect that they will switchback to the left, aiming for that relatively smooth slope. I hope the rover can last for many more years. Based on the time it has taken to get this far, doing magnificent science along the way, it will probably be a decade before it gets reasonably close to the top of the mountain. Thanks for the leg-work on all this, Mr. Z. Nice work, thanks for putting things in perspective. If we had humans there, every dip, bump, corner, pebble, and boulder wouldn’t get a name. People wont have the time to waste and it will seem needlessly pretentious. Excellent!…. You totally snagged that thought! I assume — “every dip, bump, corner, pebble, and boulder,” has a PhD Thesis attached to it, as well? Does everyone on the project get something named after themselves? Really like this stuff, in-general, but the level of minutia is unreal. In this case I do not think they are over doing it. They need some system to make it easy for everyone to know what everyone else is talking about. By giving every feature they are interested in a label, it facilitates the process, making it more efficient. It is true that if a human was doing this geological research, it would not be necessary to label everything in this way. But then, there would be no need for a large number of engineers and scientists to operate a robot as a team on a planet millions of miles away. 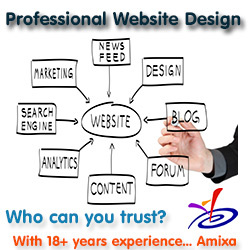 The geologist would be the team, operating on his or her own. >Food for thought, for some interesting S-F story plot-lines! Thanks Bob for the work on the added perspective, it is appreciated. I am surprised that they would be expending so much effort and added risk trying to get to a mountain peak. I’m sure the view will be great, but isn’t the geology better where the terrain has been torn open? Curiosity would be safest on the flats (remember what happened to Spirit) but risk is necessary to obtain good data. If you are going to risk the rover climbing and descending why pick going up a mountain? Landing near a crater seemed like a good way to see into Mars past geologically, but wouldn’t they want to go down instead of up? Bob: I really enjoy all the information you have on your site as well as your time on John Batchelor show. Yes, I agree with the rationale and was mostly just jesting. A human sitting on a rover could probably do everything that Curiosity has done in a couple of days, if that. We need boots on the ground. First time I’ve found this site and just want to say thank you for all the time and knowledge put into creating the detailed info. Great stuff! I really wanted to know Curiosity’s exact location. Meg: You should check out my regular rover updates that followed this post. The most recent is here. It provides links to all the others. You might even want to start at the beginning to get a feel for the whole adventure!